Heat the oil in a deep skillet over medium-high heat. 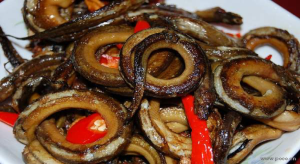 Test the temperature by dipping a piece of eel in the oil. It’s ready if it sizzles. Dredge pieces of the eels in the flour, shaking off the excess. Fry 2 to 3 minutes per side or until golden brown. Remove to a paper towel and sprinkle with salt. Serve immediately.